At this time of year, I get really restless. The days are getting lighter and longer, the future promise of a good, long summer makes me think about the garden and outside living and the angle of dangle of the sun shows up dust and tiredness inside the house, so I get really antsy to get things done. - Repainting the sitting room after the alterations in there for the new kitchen. - Replant the flower bed we've had covered in weed suppression membrane for a year, in an attempt to finally kill off the remaining ground elder. - Get the back patio re-pointed. - Get the OH to finish off all the little things he's been promising to do but hasn't. - To do a proper spring clean, all windows inside and out, intensive carpet cleaning (where required) and diligent hoovering, clearing out cupboards etc. - To make a start on the 100s of soft furnishing and sewing projects - I've had the fabric for new curtains for the spare bedroom since January last year! These are just the tip of a very large iceberg, as I have a mahoosive mental list of things I want to do. So what's on your spring list? Ribena like you have a very long list. 2. Gut office and transform into office/2nd guest room. Currently still working on the woodwork upstairs that means replacing all the door frames, architrave and skirting in all upstairs rooms and on to the landing. Four months in .... sigh. Weekend job. Once this is complete I need to order stair and landing carpet and also carpet for the main bedroom. When done massive clean up in operation as I know carpet laying will create dust. Stairs are also in progress of swapping to Oak finish with glass spindles. Almost done. Small cupboard required to cover alarm box in downstairs cloakroom. Small area on drive needs to be block paved. Roof needs to be stripped off and redone on garden room. Then I think we are there. Hallelujah! Will you be changing your wall décor this spring? Please I need your advice on how to update a "yellowish" kitchen? Cleaning all the green algae off the patio and metal furniture. I've planted a new climbing rose on the arch. Shopping for some new cushions for the garden furniture. For me its the garden... loads of planting shrubs, bulbs, cleaning patio and repointing, installing a new deck area. 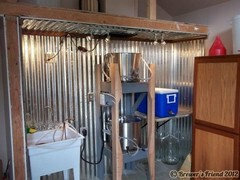 Rachel Midlands tell me about this brew house- think my husband needs one too! I have a long list of things I’d love to do to the garden but as we are (hopefully) extending this year, it will look like a building site soon so there’s no point. I’m just doing lots of planning and lists atm for the house and garden. Hi Jen. Well not sure about the technical stuff but hubby wants to build a brewing stand but have it somewhere sheltered so a glorified shed seems the best idea either with a chimney or roof hatch for ventilation (brewing creates a lot of steam). Our old shed (we’ve got two) is ready for the skip so should have space for it. 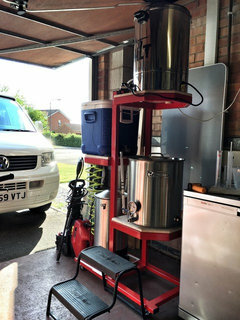 Here’s a pretty good blog about it: https://www.waltons.co.uk/blog/how-to-brew-beer-in-a-garden-shed Although last few months he’s been using the kit beers as it’s a bit nippy out. 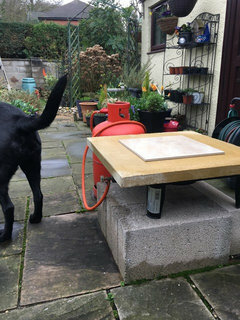 One of the pics is the current set up (please excuse dogs bum), burner goes on top of tile then we use tables and beer crates to stand the other pots n stuff, oh and big gazebo if it’s raining. Having it in a shed will save all the bother of setting it up every time. Other pics show the kind of thing we want to acheive but might make the shed look like a fancy bar hut or Swiss cottage or something. 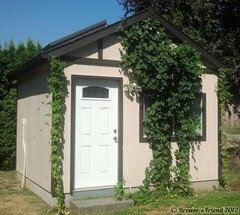 Still want to grow my own hops as well:). Just sent a load of furniture to auction- it was left over from a property I sold but there is no point in hanging onto stuff for ever in case you need it. Going to have a reorganization at work- move all the filing to the place the furniture was stored to create more space elsewhere. Next job is carpet cleaners. I get a couple of days from a painter at least twice a year to do odd jobs and make sure things are looking the best. Oh and the usual.... try to loose three stone in the four weeks leading up to a short break away next month. ".... try to loose three stone in the four weeks leading up to a short break away next month. " Made a start by cheating and hiring Bob the Gardener to clear the jungle out the back. We can now see the magnolia coming into bloom and its gorgeous. Spring clean this weekend for the whole house and rearranging some furniture in a couple of rooms to see if it works before choosing colours. Refresh of the kitchen with wall and skirting paint to follow when I have time as helping mum repaint her whole house for selling this year. Biggie this year will be the hall. 3 stories of orange stained woodwork, high ceilings and hard to reach walls. woop! Having bought my house almost three years ago after it was empty for ten years, I have a few things to do. Before I bought the place it had had squatters in a while before, they had removed the windows, plumbing fittings and anything else that wasn't nailed in place. The patio rebuilding at a lower level than the internal floors. Finalise the plan for the wiring, I have a good sized solar installation but the house wiring is not as good as you expect in a reasonable sized caravan. Strip and re-render all of the outside. Fit T&G throughout the kitchen. Restore the guest house but not this year. Make new gates for the entrance. Finish my workshop which is key to doing a lot of the other work. There is more but of less urgency, I bought this house to avoid being retired and bored, it's definitely working.